There are few home run hitters in the major leagues that can garner the respect that Ken Griffey, Jr. has. The man known as both “Junior” and “The Kid” has managed to become one of the most prolific and proficient hitters that the game of baseball has ever produced. The impressive thing is the number of teams that “Junior” did these amazing things. He has been a producer on four different teams while playing in the majors from 1989 to 2010. Griffey, Jr. has played for a variety of teams during his long career. He began playing for the Seattle Mariners in 1989 and that is when most of the major league baseball fans in the world grew to know his name. He played in a Mariner’s uniform until 1999. Then he switched to a Cincinnati Reds uniform and continued to build upon his legend. He played in Cincy until 2008. He switched to a Chicago White Sox uniform for the 2008 season, but by then he was showing signs of slowing down a bit from the prodigious output he had been showing prior to that. He returned to the Seattle Mariners in 2009 and played for them again until 2010. During his time playing, he has had the chance to represent his team in the All Star game 13 times. He also became a 10-time Golden Glove Award winner. 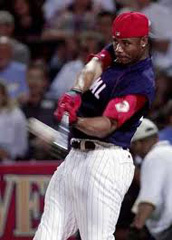 It is during at least three of those appearances in the All Star Game that he ended up dominating the Home Run Derby. He won the Home Run Derby three times. His first was in 1994. He then had a bit of a break, but returned to win the Derby in consecutive years of 1998 and 1999. Ken Griffey, Jr., continued to produce home runs even after that. Starting in 2000, however, Griffey’s performance began began to decline a bit, at least according to most baseball scholars. He still had some punch left in him, however. 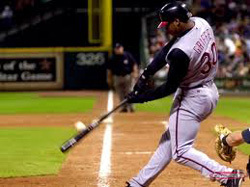 He hit his 500th home run to end up in the 500 Club in 2004. The day was Father’s Day and the place was Busch Stadium in St. Louis. To make things even more special for the Griffey family, Ken Griffey, Jr.’s, father was in the stands when he did it. Junior has returned again and again to the All Star game, and has participated in the Home Run Derby multiple times. In 1994, he led the league in votes to get into the All Star Game. He also won his first Home Run Derby championship. The only flaw with that entire season was that it was shortened by the player’s strike that year. Had it not been, many fans still wonder just how far Griffey, Jr. might have gone. These days Ken Griffey, Jr., has retired from baseball. He officially retired in June of 2010. He also earned 2,781 hits and 1,836 RBI.